Rob Ford not smoking crack. 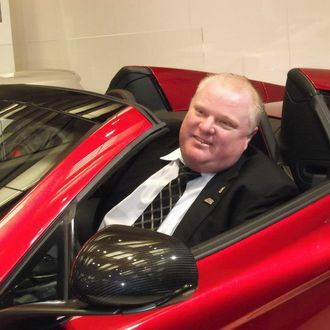 If you like tales of skeevy political intrigue, you will almost certainly enjoy Gawker editor John Cook’s account of his trip to Toronto to investigate a tip about a video of Toronto Mayor Rob Ford smoking crack. Cook says he saw a recording of Ford taking a hit from a glass pipe, and that the tape’s owner is looking to sell it for “six figures.” (Apparently Gawker wasn’t willing to spend that kind of money.) Ford’s lawyer denies that the footage is real but, if it is, it might explain a few things about the conservative mayor’s weird recent behavior, such as his dash from a community meeting to place campaign magnets on cars, his intoxicated ejection from a military gala, or his alleged drunken groping of a former mayoral candidate.